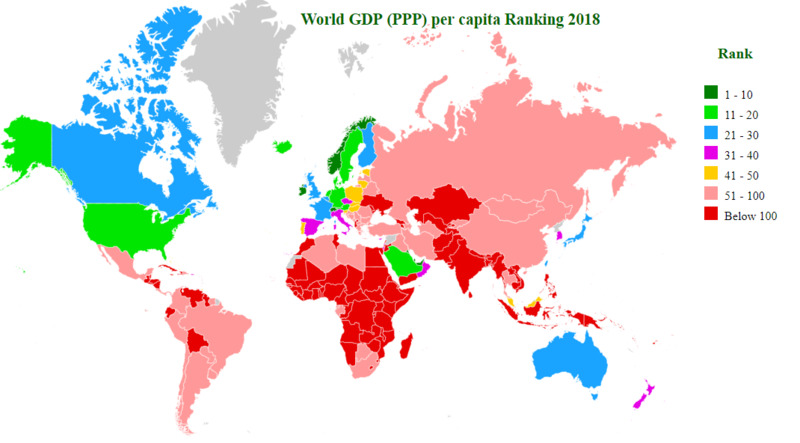 GDP per capita is gross domestic product divided by midyear population. To make meaningful comparison, PPP is used to compare economies and incomes of people by adjusting for differences in prices in different countries. This ranking is based on IMF World Economic Outlook (April-2015). Qatar is richest country of world on PPP basis. GDP (PPP) per capita of Qatar is estimated at 143,427 international dollar in 2014. Per capita income of Qatar is 9.52 times greater than world average $15,189. GDP (PPP) per capita of Qatar is decreased by $2,112. Luxembourg, which is richest country in nominal terms is at second place. Singapore is at third place. Top ten richest countries in 2014 are : Qatar, Luxembourg, Singapore, Brunei Darussalam, Kuwait, Norway, United Arab Emirates, San Marino, Switzerland and Hong Kong SAR. In top ten, GDP per capita of 3 countries has decreased in 2014 compare to 2013. These three countries are : Qatar, Brunei Darussalam and Kuwait. In this list, six economies are located in Asia continent and four are located in Europe continent. All countries has population of less than 10 millions. Change in Ranking: Ranking of Top 15 countries in 2014 is same as of 2013. Australia (16th) and Austria (17th) has interchanged their position. Continent-wise - Top 3: Asia : 1. Qatar, 2. Singapore, 3. Brunei Darussalam. Africa : 1. Equatorial Guinea, 2. Seychelles, 3. Gabon. Europe : 1. Luxembourg, 2. Norway, 3. San Marino. North America : 1. United States, 2. Canada, 3. Trinidad and Tobago. South America : 1. Chile, 2. Argentina, 3. Uruguay. Oceania : 1. Australia, 2. New Zealand, 3. Palau.